Today, I found out about an offer that is impossible to resist and thought the word should be spread about it immediately so that people can start benefiting right away. 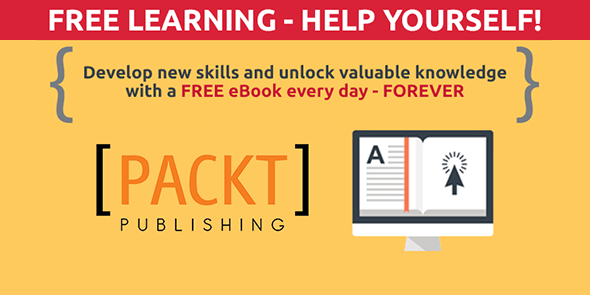 Packt Publishing has started this “Free Learning Library” which means that customers get a chance to grab a free eBook everyday! Book of the day (if you like) remains available for up to 24 hours and then changes to the next one in the list. Once clicked on the “Claim your free eBook” button, the book is added to your account. Now I realise that not all books might be of interest and you might have some of them already (like today at 11/06/2015 1700 BST), it’s “vSphere High Performance Cookbook” by Prasenjit Sarkar, which I already own) but I don’t mind having other free eBooks so it’s a great offer in my opinion. Hope you can find the eBooks you want. If interested, click on “this link” to start getting your free eBooks.